Adjust oven rack to middle position and pre-heat oven to 350°F. Line muffin pan with with 10 cupcake tins. In a medium bowl, whisk flour, cocoa, baking soda, and salt until combined. Set aside. In a large bowl, whisk sugar, buttermilk, oil, egg, and vanilla until combined and smooth. Whisk in dry mixture a little at a time until smooth. Spoon the batter into the cupcake tins, diving evenly. Bake until the centers are just set...about 25 minutes. Let cool in the pan for 10 minutes, then transfer the cupcakes to a wire rack to cool completely. While the cupcakes are cooling, prepare the buttercream. In a KitchenAid mixer bowl, whisk sugar, egg whites, and salt until combined. Set the bowl over a pan of simmering water and gently whisk until the mixture reaches about 160°F on an instant read thermometer. Immediately transfer the bowl back to the mixer, fitted with a whisk attachment. Whip on medium-high speed until the mixture is just cool. On medium speed, whip in the softened butter, one piece at a time until combined and creamy. Add the peanut butter and vanilla, and beat until smooth. Transfer the peanut butter buttercream to a pastry bag fitted with a plain circle tip (I used #8). Pipe about 1/3 cup frosting onto each cupcake top. Chill cupcakes in the fridge until the buttercream is completely firm...about 1 hour. When the cupcakes have chilled, make the chocolate coating. Place the semi-sweet chocolate and oil in a medium bowl and place over a pan of barely simmering water. Gently whisk until the chocolate has just melted and the mixture is smooth. Transfer the chocolate into a large mug or bowl. 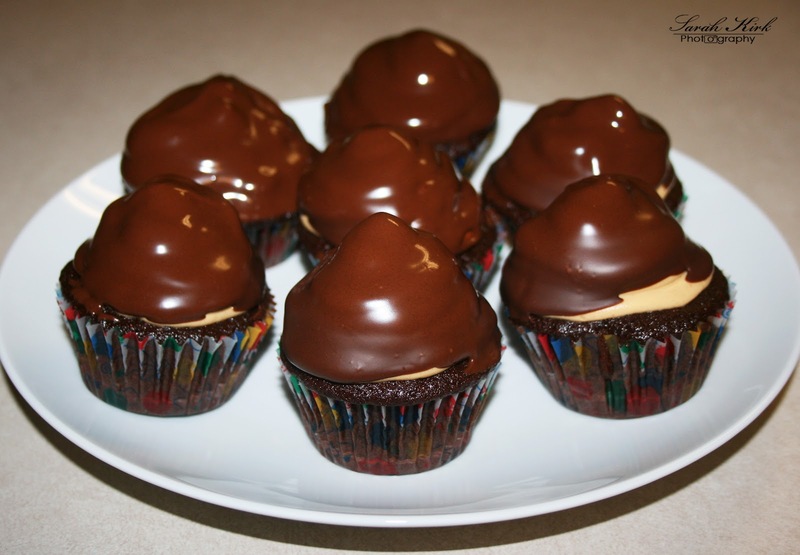 Holding the cupcake by the bottom, dip it into the chocolate to submerge all of the frosting. Pull up the cupcake and let the excess chocolate drip off for a few seconds before turning the cupcake right side up. Transfer them to the cooling rack and let them rest for a few minutes to allow the chocolate to set and the buttercream to soften. Serve and enjoy. Enjoy immensely! This recipe is from Serious Eats.